Mr. Sloto is a pretty secretive and mysterious guy - don't you think? Well, not really when it comes to giving you winning chances this May! Join Mr. Sloto as he welcomes the 5th month of the year with up to 100 Free Spins you can claim in the exciting reels of Secret Symbol. 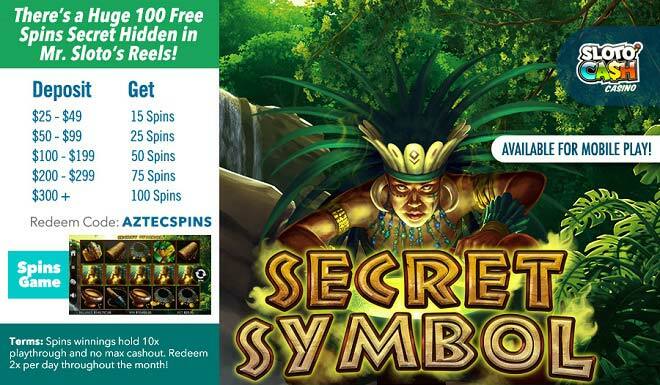 Spin for wins with help from an old Aztec civilization, pyramids, an Aztec Chief, a secret multiplier and much more! Prepare to embrace May wins as you visit Mr. Sloto's secret civilization of wins when you make a deposit of as little as $25!